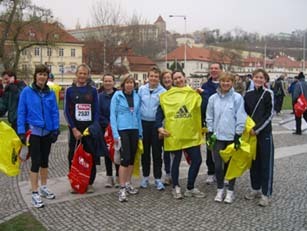 The trip to Prague for the half marathon on 24th March had the usual series of mishaps including a missed flight and lost purse, but otherwise our 14 travellers enjoyed a great weekend away in the lovely city. The 10 runners all completed the winding course with it’s charming cobbles and tram lines, and the 4 spectators braved the chilly wind to cheer them on. Well done to everyone, especially Colin who came second in his age group ! Must have been the free beer en route !